Some time ago, the CEO of Moon Studios (creators of Ori and the Blind Forest) reached out with an offer. They needed a level designer for their upcoming sequel, Ori and the Will of the Wisps, and I was a potential candidate for the job. I gladly accepted the offer. Ori is one of the many games I was able to enjoy lately. One can see the love and attention to detail that went into its design. I feel like I'll be right at home working with this team. It's a pretty huge change in my life, since it's a full time job. But dreams are there to be chased, my family supports this decision and it could be the beginning of a new career. I want to thank you again, awesome people that kept AM2R alive with your motivating words, your lets plays and reviews. Without you, I wouldn't be sitting here writing this post with a huge smile on my face. As for my personal project, I'll keep researching and slowly expanding it on my free time. What wonders await me within the depths of and awesome indie studio? That is awesome! I love Ori and I love AM2R so now I'm looking forward to Ori's sequel even more. I've been following this blog since you put out the very first demo or something so I'm kind of proud of you, haha. Congrats Milton! I’ve been following this blog for years and I’m so happy to see your talent get recognized! They say that this is no longer an indie studio. Microsoft First Party Developer. I've read the news article about your job position which is quite exciting, I'm wishing you the best of luck in designing some stellar levels for the next Ori & The Blind Forest game as I will be looking forward to it. On a related note, happy AM2R anniversary Milton! Congratulations! I'm happy the several years of work on AM2R got you an opportunity to do what you like again. Congratulations! I love the look and feel of that game. Looking forward to the sequel! File is not opened for reading. Man dude I was waiting for the day that your work gets recognized like this. I check back at your website just about every other day for any updates and this is something I really wanted to happen. Good luck out there and I hope you bring more memorable moments to whatever game you are to work on. I'll buy it right away! Congartulations! You totally deserve this! 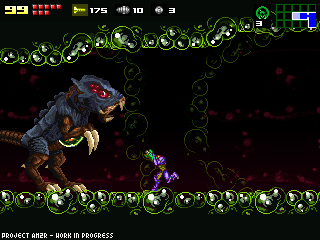 This is awesome news indeed, not only for you (and Moon Studios), but for the whole scene of metroidvania enthusiasts! Ori and the Blind Forest is one of the best obviously 2D Metroid inspired games out there so who better to join the team than a guy who spent 10 years of his life researching 2D metroids while developing a remake for one =). Good job! I wish i could get that kind of job, but i'm not very good at making games just the story. That is awesome!Good job, I love it. Congratulations! They couldn't have picked a better man for the job. Glad all your hard work paid off in a concrete way! You deserve this ! I'm really happy you could work on such a game ! Also I'm happy for the recognition you got for AM2R that was such a beautiful game. SIIIIIIIIIIIIIIII!!! DIOS MIO COMO ESTAS DOOOC!! LOOOL DE VERDAD QUE NO ME ESPERABA ESTO PERO TARDE O TEMPRANO IBA A PASAR! !, no sabes cuanto me alegro por ti amigo apenas sube de esa noticia hoy por saselandia tenia tiempo sin entrar precisamente hoy estaba pensando entrar y justo salta esa noticia! FELICIDADEEES!!. Te lo mereces doc! !, y conociendo el tan buen juego que fue ori (y que aun por desgracia no juego y espero que dentro de poco lo juegue) seguro haras un gran trabajo!! dios que emocion!1 ojala todo salga bien! te deseo lo mejor hermano!, que sepas que aqui siempre vas a tener el apoyo de cada uno de nosotros no importa el rumbo que tomes! un gran saludos y exitos!! I'm so happy for that!!!! I would be willing to purchase a copy and the right to build on top of AM2R for my upcoming game Anti-Mimic Rescue starring Samu the Samuian. So does this mean your relocating to Austria? Dude, you rock. I wish you the best of luck in all your endeavors. It was a blast watching this project evolve over time, and a year later, I still love all of the prior demos and the final product. You did a great job and should be very proud of yourself; truly a labor of love that made me appreciate anew one of my favorite video games again. Thanks! Congrats! I admit I'd have bought Ori 2 anyway, but knowing you'll be part of it makes me certain it'll be even better than the first one. You should be fired for lying about the C&D. You've yet to post any evidence it existed, and I contacted Nintendo myself. They said they never filed a C&D. Im so happy right now!!! Want to say great job on AM2R really come close to the real thing! I would like to donate but I don't find no way to do it. Hit me up with a link like that i could do so. Again congrats and good luck with your new job! Metroid is not just a game but a culture and we the gamer are the follower- Don't forget us. Given how thoroughly enjoyable AM2R and "Confrontation" are, and the sheer quality that went into them, I will keep a keen eye out for whatever you help to make. I'm not exactly an fanboy of indie developers in general, but supporting the smaller devs as well as the big ones is important anyway. And I'm always happy to buy from the (to me) big 4: Studio Pixel (Cave Story), WayForward (Shantae), Yacht Club (Shovel Knight), and you. can we please make mods to work with your work it would be like the game zelda classic.fur the fans of the metoidvania game's.if done right we fun's can keep life to the loved series.and in making ned game wold's and scipt's as well new gear.for unique gameplay.that even nnintendo dose not have copyright too.i know you don't want nintendo being mad at you.but you gave this game a grate life as a fan to this and all metroid and metroidvaniad game's. it would help codesrs to pursue making new wold's for others to make.